The Life and Death of King John is a very good play. It's similar to my recently reviewed Richard II in that there are no outright heroes or villains; it is instead a play about fallible men attempting to control events that are beyond their capacity. The real villain of the play is the papal legate, Cardinal Pandulf, whose first appearance in Act III shatters the fragile, new-minted peace between France and England. Later he encourages the dauphin Louis to pursue his claim to the English throne (through his marriage to Blanche of Castile) when Arthur is captured, only to abandon him when the Pope gets what he wants - John's submission to papal suzerainty. 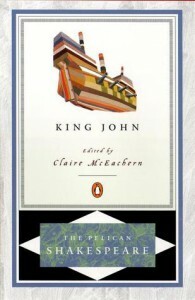 An undeservedly neglected play, I would recommend King John strongly.